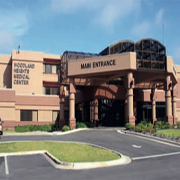 Woodland Heights Medical Center is a 146-bed facility in Lufkin, Texas, 120 miles northeast of Houston in East Texas. The hospital is accredited by the Joint Commission on Accreditation of Health Care Organizations (JCAHO) and in 2006 was awarded the Distinguished Hospital Award from HealthGrades. The facility has a broad range of services, including Open Heart Surgery Center of Excellence, Digital Bi-plane Cardiac Cath Labs, Sleep Disorders Laboratory, Wound Healing Center, The Women's Center (Labor & Delivery Services), Imaging Services - MRI/MRA, Special Procedures, Spiral CT, Digital Ultrasound, Inpatient and Outpatient Rehabilitation, Outlying Primary Care Clinics and an Ambulatory Surgery Center. Located in the beautiful Texas Forest Country, Lufkin is filled with surprises for all ages. Discover how surprisingly convenient Lufkin is located to major cities like Dallas, Houston, San Antonio and Waco, and explore through our city's unique opportunities for fun weekend trips or even regional conventions and meetings. It's also a surprise to find a city complete with superior bass fishing, top notch golfing, state of the art museums, an outstanding zoo, quality hotels and restaurants, incredibly charming downtown, and the friendliest people on earth. With all of this to offer, it's no surprise to us why we know you'll love Lufkin.